Take your holiday into your own hands! What is the PARK SNOW Card? Our PARK SNOW Card is already well-known in our resort for several seasons. Visitors know what it is through using the free discount card they received in our partner accommodation facilities where they have to stay for at least 2 nights. The card allows them to access services at bargain prices. There is a 2.20 � issue charge. A bonus with the card is a classic postcard which you can send or keep as a souvenir. 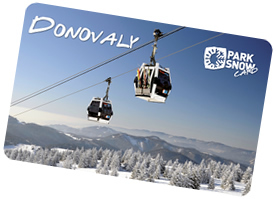 PARK SNOW Card is your key to getting full enjoyment not only out of your holiday in Donovaly, but also with many of our partners across the whole of Slovakia. How do you receive a guest card - PARK SNOW Card? You receive your guest card, along with all its benefits, when you make a booking with your holiday host prior to your arrival at the resort. It also depends on your length of stay because a card for a short stay (2-4 nights) differs from that for a long stay (5-7 nights). You pick up the card either at your place of stay or from the info centre. The price of the guest card is 2.20 EUR (incl. VAT). The condition to receive the card is that you have a minimum 2 night stay in any of our Partner facilities and you are at least 6 years of age. How does a guest card - PARK SNOW Card work? Easy, carry your card on you all the time and show it at our partners� services and facilities to get great discounts when you use their services! Every partner that accepts your PARK SNOW Card is easy to recognise by the sticker on their facility saying so. Your PARK SNOW Card will be issued from 1.12.2015 until 31.3.2016 to you when you check in at any of these Partner facilities. We wish you a pleasant stay full of unforgettable experiences with your PARK SNOW Card.